This last period of waiting for the finished copy, cover on and contents listed of Ghostly Spirits of Warren County, NC & Beyond can be a bit unnerving. So I just go forward writing the next manuscript which is the collection of all those little bits of paper recording all my paranormal experiences since I first noticed way back when. As I wander around the house talking to myself, bringing the images of memories to the forefront of my mind, I notice Lady Jane in the bathroom sitting in front of the mirror. 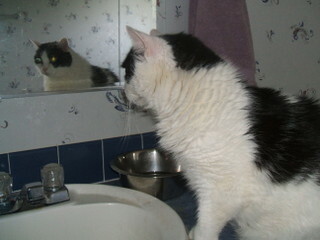 She loves the mirrors in the house and often spends quiet time-maybe not so quiet for her-seemingly to just sit there. But I wonder if she is looking deeper into that mirror than most of us do. Ghosts have been photographed in mirrors. Before coming to Warren Plains, Alice and Duane lived in Warrenton, Virginia where a ghostly image was photographed in their mirror and published in the Fauquier-Times Democrat along with an article by Joe Winkelmann. They told me of their experiences with the afterlife. Soon you can read about it too.